How low will Apple go? Apparently, not all of the way down to match Amazon and Google’s $199 price for a 7-inch tablet. Nevertheless, with its bigger display, superior app selection and category crushing industrial design, the iPad mini price will be very, very competitive indeed. 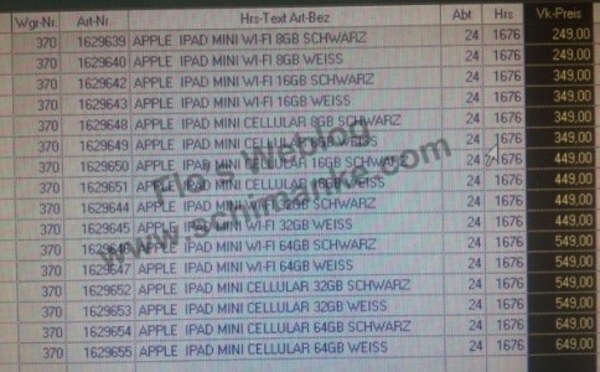 So, the iPad mini release on October 23 seems a pretty sure thing and many voices have gotten behind the idea that it will offer iPad 2 class specs with an A5 processor, dual-core graphics and 512MB RAM. However, the open question to date about the iPad mini has been price — let’s just scratch that off the list right now. Given the nice, neat price spread shown, it seems safe to assume that US iPad mini prices will be exactly the same, starting from $249 and going up precisely thereafter. An additional wrinkle in that matrix is the expected availability of white and black versions of each configuration.